The “Festive Fixtures,” as the Premier League likes to market them, take place every year within a 10-ish day period from just before Christmas Day to just after New Year’s Day where each team plays three games. It is a great watch for the fans and something to look forward to every year, because it often leads to results which end up very important in determining who wins the league, and also who ends up in position for European competition. There are still a couple games left before this year’s festive fixtures are done, but as we stand, each team has played 20 games of the 38 they have scheduled for this year. So, as we’re just around halfway through the season it is a good time to discuss each team’s performances so far. This year’s Liverpool team has looked, in one word, unstoppable. They’ve yet to lose, even 20 games through the season, and have looked very impressive doing so- with a goal difference of +40 to go with an impressive record of only 8 goals conceded. As much publicity as their offensive attack, led by Mo Salah, Roberto Firmino, and Sadio Mane gets, their defense has been just as impressive and is their biggest improvement from last year. It is still unlikely that they finish the season unbeaten, but history is on their side to win the league- no team has ever been up 7 points at New Year’s Day and not won the title, so anything other than a Premier League Title at this point should be considered a massive collapse. Their game this Thursday, January 3rd, against 2nd place Man City, will go a long way in possibly securing the title, but whatever the result of that game, it is nearly impossible to see Liverpool not taking the title this year. Manchester City is the only team, in my opinion, with a legitimate chance at beating Liverpool to the Premier League title this year. They were the champions last season, in dominant fashion- finishing with more points than any team had ever done in a Premier League season. Their team is largely unchanged, but they have missed star midfielder Kevin De Bruyne for almost the entire year with a ligament injury in his knee. For them to have a shot at winning the league, he will have to come back soon and hit top form- quickly. Tottenham’s title chances took a massive hit in their last game, a 3-1 home defeat to Wolves in a game they would have expected to win easily. Losses like these are absolutely brutal, especially when chasing down a team that is setting a pace like Liverpool is. Despite Tottenham having put together their best ever start to a premier league year, their title chances look slim and it is in their best interest to turn their main attention to getting all they can out of their Champions League run. Chelsea has endured an up and down season by their standards. After losing former manager Antonio Conte, they have impressed at times, holding Liverpool to a draw and defeating Man City 2-0, and have looked a little worse at times, losing games to Wolves and Leicester. They look to be in good position to finish in top 4 for a Champions League spot, and will likely be trying to keep Arsenal off their heels for that spot for the rest of the season. Arsenal, also, has had a very up and down year with their new manager, Unai Emery. After successive defeats to City and Chelsea to begin the year, they went on a 22 game unbeaten streak in all competitions. While this is impressive, some of those 22 were draws in games they would have expected to leave with a win, and this has hurt them in the table, and after recently being dismantled by Liverpool, morale is a little low around the club. Despite a great start of the year for Pierre-Emerick Aubameyang, who is tied for the league lead in goals with 13, there have been plenty of disappointing performances mixed in with the better moments. However, the goal seems to be a Champions League place, and the top 4 is not out of reach as Arsenal heads into the second half of the year. Ever since Jose Mourinho was fired, Man U has seemed to be a different team- attacking with much more confidence, playing more freely on the field, and most importantly winning games. Their poor start may have put them in too big of a hole to climb out of to challenge for the top 4, but they can still look to the future with hope, whether they stick with current interim manager Ole Gunnar Solskjaer or bring someone else in. Wolverhampton has impressed this season. They have managed to take points out of games against quite a few solid teams- Arsenal, Tottenham, Chelsea, and United included- and are within striking distance of 6th place for a possible Europa League place, which would be huge for their fans and club. Leicester City, unfortunately, went through a very rough patch during this first half of the season, when their owner died in a freak helicopter crash just outside their home stadium. On the field, they have been uneven this year, at times showing flashes of the ruthless attack that led them to the Premier League title in 15’/16′ and taking down giants like Man City and Chelsea, but too often dropping points in winnable games against lesser opponents. Watford, 10 games into the season, looked strong- winning 6 of their first 10, beating teams they were supposed to. But a lack of discipline in defense (including 3 red cards) has led them to a record of 2 wins, 3 draws, and 5 losses in their last 10. 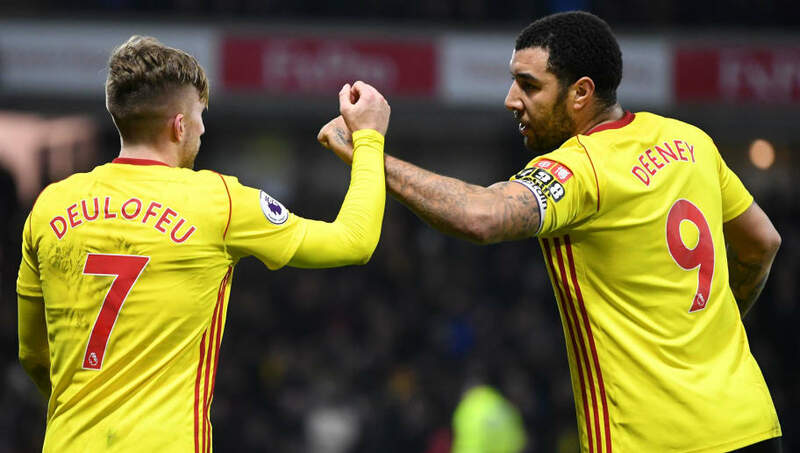 They are falling off, but with goalscorers like Roberto Pereyra and Isaac Success, they are always a threat to pull an upset over an unsuspecting team. Everton has had a very disappointing season, there is no way around it. A team that considers themselves to be of a size to be able to compete with the top 6, and nip around the European Competition spots, to be in 10th place at the halfway point is performing far below expectations. They have drawn 6 games, tied for the most in the league, which seems to show that potentially signing a big attacking or defensive option in the January transfer window could turn some of these draws into wins and possibly help Everton climb up the table. West Ham, similarly to Everton, are a team that normally goes into seasons with aspirations of being in a position to fight for a top-6 spot. After their move to the new London Stadium a few years ago, they expected to be in that position by now- but have struggled this year to garner any momentum for an extended amount of time this season, and find themselves in no mans land- out of reach of relegation, but also too far down to reach Europe. Bournemouth came to the Premier League for the first time in club history in 2015. With this, it is not necessarily discouraging to see them at 12th in the table- this shows that they are not one of the teams who finally gets promoted just to get sent back down one or two seasons later. 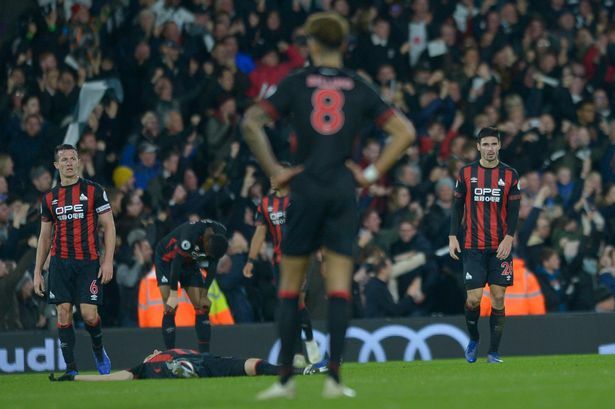 It appears that they are here to stay, however with the type of production they are getting from players like Callum Wilson (8 goals, 5 assists) and Ryan Fraser (8 assists), I don’t feel that it is asking too much for them to sure up their defense if they want to become a legitimate threat on a game to game basis. Last year was Brighton’s first season in the Premier League after being in a position, just four years ago, where they were teetering on being relegated from the Championship. For a team who just made it back to the top division, sitting in 13th place halfway through the year is nothing to be ashamed of, and if they continue on their current trajectory, it would not be a surprise to see them finish this season top 10 and possibly higher next season. Crystal Palace has gone through a rough patch in the past few seasons. They have gone through 4 managers since 2016 and have been in multiple relegation battles in that time. They have been considered a “yo-yo” club in their recent history, meaning they bounce between the middle-bottom of the Premier League and the top of the Championship from year to year, always in contention to get relegated or promoted. So to be in 14th, a few points outside of the relegation zone, it may be a little less of a stressful year than usual. Newcastle, just a few months ago, was in a position where their own manager, Rafa Benitez, said it would take a “miracle” for them to be able to avoid relegation. They have managed to create a little room now, but they are far from safe as they face a difficult road right ahead with games against Man U, Chelsea, and City all on the slate for January. Cardiff is currently riding high after finally winning their first game away from home this year, away at Leicester City. Sitting at three points above the relegation zone, however, they will need to continue to have strong performances to stay up. For a team which just was promoted to the Premier League this season, it is hard to expect much more. Southampton is one of the teams that is a staple of the Premier League. From 1992 to now, they have only spent 7 years outside the League. So it is saddening to see them in the current position they are in- having had 5 managers since 2016 and generally struggling to stay afloat. This may be the year they finally go under and return to the Championship. Burnley’s decline in defense this year has been both rapid and confusing. They have already conceded 41 goals, which was more than they gave up during the entirety of last season. Seeing as how their team is built off winning low scoring games, this shows why they have declined so far in the table as well. Fulham’s dreadful defending has proven to be lethal to their chances of remaining in the Premier League next year. They have given up 43 goals already, most in the league, meaning that most matches they need to hope to score 2 just to have a shot at getting any points out of the game. This is obviously not a recipe for success and is the main reason why they stand in a position to be relegated at the end of the year. Huddersfield, which finished only 4 points above the relegation zone last season, are now almost surely guaranteed to be relegated after this year. They’ve managed to score only 12 goals so far this season and have lost their last 7 games.